From the towering summits of the Great Smoky Mountains to the depths of the sprawling Tennessee River Valley, Sevier County is one of the premier vacation destinations in the southeastern United States. 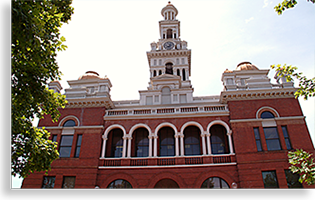 Sevier County, one of the oldest and largest counties in Eastern Tennessee, established its county seat in the newly constructed town of Sevierville in 1795. Its namesake Sevier, derives from Colonel John Sevier (1745-1815), a legendary frontiersman, Revolutionary War hero, statesman, a commander of southern colonist and frontiersmen, the first Governor of Tennessee and the Governor of the failed State of Franklin. The State of Franklin was to be an independent nation created out of what he considered unclaimed American Territory mainly parts of eastern Tennessee and the mountains of western North Carolina. What he considered unclaimed territory was the land of the Cherokee. To the Cherokee People he was a greatly despised Indian fighter who diligently worked at forging their lands out of their hands. John Sevier’s life story is quite an interesting one, regarding the early history of the southeastern United States and its conflict with the British. He settled in next-door Knox County yet his name continues to echo against the walls of the great mountains. With an enormous mountain barrier of Smoky Mountains and Blue Ridge Mountains to the east, this once isolated frontier farming community of Sevier County has risen in renowned popularity due to its obscure yet ideal geographical location at the western foot of Great Smoky Mountains. Considered a tourism Mecca, Sevier County today offers the ideal fun vacation destination with both indoor and outdoor recreation which includes mountain adventure, golf courses, live entertainment, theatrical performances, museums, amusement parks, water parks, shopping sprees, a vast selection of great dining, lodging to suit your desire, camping, bass, trout or fly fishing, rafting, kayaking, canoeing, fun-yaks, tubing, horseback riding, mountain biking, hiking, waterfalls, wildlife sightings, boating, skiing and swimming at Douglas Lake. Local events and festivals go the year round and that’s just a part of what you’ll find in Sevier County. The one thing you can’t miss is the greatest treasure Sevier County and Eastern Tennessee has to offer, it’s also one of the earth’s most precious biospheres. The Great Smoky Mountains National Park, a mountain parkland-wilderness containing wildlife, natural wonders, spectacular mountain views and rushing waterways, all preserved and protected for the enjoyment of all ages for now and generations to come. Since 1940, millions of visitors each year experience a part of the US you have to see and touch to believe. 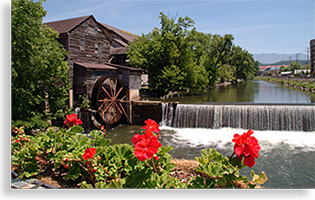 Sevier County and its popular towns of Pigeon Forge, Sevierville and Gatlinburg along with its charming artisans, business and residential communities are surround by a landscape that can only be described as absolutely amazing. Sevier County is one of the most diverse counties in the Blue Ridge Mountains Province; its location lies below the highest points of the Great Smoky Mountain’s vast range. These three towns Sevierville, Pigeon Forge and Gatlinburg are only three of the many communities you’ll want to visit while in the foothills of the Great Smoky Mountains, but it doesn't stop there. Throughout Sevier County there are numerous towns and artisan communities offering specialty shops, souvenir stores, art galleries, restaurants and a variety of lodging from lodges, inns and cabin rentals to bed & breakfasts and hotels. The principal towns are quite lively; the smaller communities off the Parkway offer more quaint view of Sevier County. Their rural settings offer another glimpse into a world of mountain life under the Smokies. 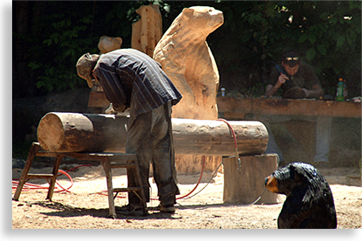 We observed several locations where we found artist outside of their shops carving full size images of black bears out of huge logs. Communities and small towns like Pittman Center, Rocky Grove, Shady Grove, Jones Cove, Richardson Cove, Laurel, East Fork, Cedar Bluff, Williamsburg, Millican Grove, Dupont, Knob Creek, Newell Station, Seymour, Boyd's Creek, Glades, Kodak and Underwood all have something to offer to make your visit to Sevier County even more enjoyable. From the depths of the waters of Douglas Lake along the pathway of the French Broad River in the northern end of the county, Sevier County sweeps along the broad valley floor with foothills and low mountain ridges slipping in and out of the landscape, dividing the lowlands into small and large valleys and hidden coves along its mountain barrier. The steep slopes of the central Smoky Mountains climb to 6,643 feet at Clingmans Dome one of the highest mountain peaks in the eastern United States. The broad shoulders of the high mountain ranges of the Smoky Mountains acted as a natural barrier for Early American and Native American transportation, you can either go the extra long way around or the extra hard way over the top. What makes Sevier County’s location even more unique is that it sits along the central base of the West Prong of the Little Pigeon River. The rushing river has cut a northern path downward through the heart of Tennessee’s Great Smoky Mountains National Park from its watershed near the popular Newfound Gap creating a natural corridor up and over the highest mountains. It was the dedication and opening of the Great Smoky Mountains National Park in September of 1940 that brought the eyes of the nation to Sevier County. A tourism business was created to serve the needs of the many visitors who arrive throughout the year. The numbers of visitors to the Great Smoky Mountains National Park quickly increased over the years making the Great Smoky Mountains National Park the most visited National Park in the nation. The tourism service industry has increased in Sevier County over the years to such a degree that the Great Smoky National Park has become just one of its highly regarded features along with the many other opportunities for personal enjoyment. These additional options offer, live theatrical performances by major artist and other exceptional talents, fine dining to suit anyone’s taste, a vast array of shopping along miles of main thoroughfares and in local communities, amusement parks of all types, several golf courses, lodging galore, and outdoor adventure at every turn. These tourism towns have become so popular over the years that many of the visitors who come the Sevier County don’t even visit the great national park. That is some relief to the Great Smoky Mountains National Park with its millions of fans still visiting annually; keeping mass numbers of people in local towns having fun helps to maintain the fragile ecosystem of the parklands preserve. With the valley out front and the mountains out back Sevier County has a world of fun recreations awaiting lovers of the outdoor throughout the county. 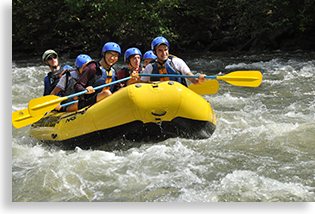 Boating, fishing, hiking, camping, horseback riding, rafting and more is what you’ll find in the great outdoors of Sevier County, most opportunities for outdoor fun are available throughout the year. From Douglas Lake and the French Broad River in the northern parts of the county to the coves and valleys in the central section of the county along the edge of the national park, and into the Great Smoky Mountains National Park itself there are over 650 square miles of Sevier County to discover. Trout fishing Bass fishing, and fly fishing along rushing waterways, hiking, camping, mountain biking, horseback ridging, rafting, kayaking and water tubing are only some of the activity available in this most diverse county within the Great Smoky Mountains and the people of Sevier County making it all possible. Sevier County, the “Gateway to the Smoky Mountains,” is by far the most visited region in all the Blue Ridge - Smoky Mountains Province. Millions make their way here annually due to the abundance it has to offer each guest. 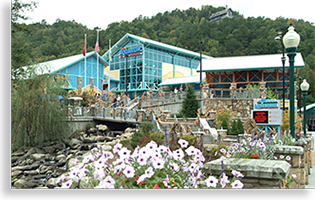 Sevier County is the family vacation Mecca it proclaims itself to be, with fun, adventure, live entertainment, theatrical performances, a wide array of shopping, dining, lodging, golf, outdoor sporting, water recreations and so much more. Below I’ve listed just a few must see places in the great outdoors, plus scenic drives. Sevier County Tennessee, a land rich in heritage, beauty and natural wonders, once you’ve visited your sure to come back. On September 2, 1940 at Newfound Gap on the top of the Smoky Mountains, President Franklin D. Roosevelt officially dedicated the opening of the Great Smoky Mountains National Park. The 521,000-acre parkland is considered a primary jewel in the crown of America’s national treasure. The Great Smoky Mountains National Park is shared by two states, with Tennessee containing 45 percent of the national park and North Carolina the remaining 55 percent of the park. The Smoky Mountains are a broad mass of mountain lands on the northwestern edge of the Blue Ridge Mountains Province and part of the Southern Appalachian Mountains. 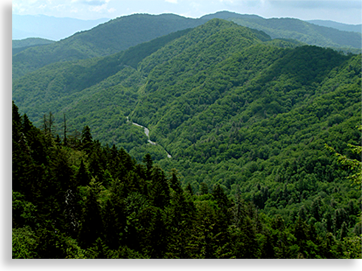 Within the formidable Smoky Mountains are some of the tallest mountains in the eastern United States. The Great Smoky Mountains National Park are completely preserved and protected from sale or destruction by the federal government, protecting its cherished contents and natural resources for untold generations to come. The federal government protects National Forest though they may be used for their natural resource and some lands may be sold according to government approval. National Park status is the highest order for protection and preservation. Well over 10,000,000 people a year visit the natural wonders within the national park. Rushing rivers, creeks and streams make for a fishing person’s paradise; deep coves and the high mountain country take hikers and back packers into the remote beauty of the national park. Hidden waterfalls and unique rock formation as well as breathtaking views make hiking in the park well worth the journey. Lost communities abandoned and isolated in the national park take you back to a simpler time to a forgotten world; views from the mountaintops will render visitors speechless. The beauty of wildflowers and the sightings of wildlife natural to the Smoky Mountains are thrilling. 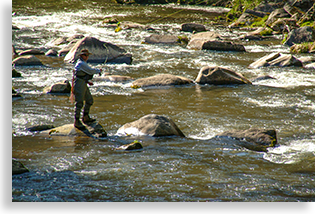 Over 700 miles of trout streams crisscross the park with more than 800 miles of hiking trails including the Appalachian Trail, which traversed the entire length of the national park traveling along the highest mountain ridges and summits. 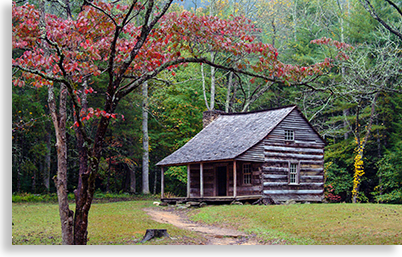 Camping in the Smoky Mountains is a special treat due to its historical fame; contact the rangers at the Sugarland Visitors Center or the Oconaluftee Visitor's Center for information about camping, fishing or backpacking in the national park. Of the 521,000-acres of national parkland, approximately 100,000-acres are old growth forests. The Smoky and Blue Ridge Mountains were devastated at the turn of the 20th century by large-scale logging. These 100,000 acres were saved by the creation of the Great Smoky Mountains National Park. 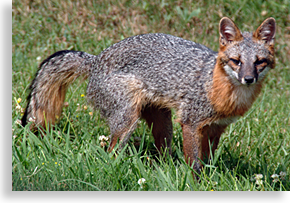 The founding of the national park and other national forests like the Cherokee National Forest in Tennessee and the Nantahala and Pisgah National Forest saved all the remaining smaller tracks of old growth forest and placed them under the protection of the federal government. The Civilian Conservation Corp formed by the federal government took thousand of workers into the mountains and established camps. Their main objective was to reforest the barren slopes with hardwoods, built trails, bridges, roads and many stone structures located throughout the Smoky and the Blue Ridge Mountains. To preserve the unspoiled beauty of the Great Smoky Mountains National Park roadways have been limited. The two most used roadways are paved, the first is Newfound Gap Road which takes you from north to south over Newfound Gap linking the Tennessee River Valley with the mountainous interior of North Carolina. The second most poplar scenic drive is the Cades Cove Road. This paved road follows a route along a rushing waterway deep into the Tennessee Smoky Mountains arriving at a lost valley where a 19th century mountain community once thrived. Everyone should have the opportunity to visit the Great Smoky Mountains National Park; it has so much to offer and it belongs to this nation and its people, a memorable experience for folks of all ages. If your planning a trip to the Great Smoky Mountains National Park you will be experiencing the thrill of the Newfound Gap Road. The Newfound Gap Road crosses the national park north to south or vice versa along US 411 from the town of Gatlinburg Tennessee to the town Cherokee in the Qualla Boundary in North Carolina. Being the only through route through the national park, the Newfound Gap Road sees millions of visitors each year. Though the Great Smoky Mountain Park is closed during the winter months the Newfound Gap Road stays open except when there’s snow or ice on the mountain road in the wintertime, you should call ahead to find out weather conditions before traveling. The Newfound Gap Road, is a paved two lane road that takes you from the valley floors into heavy forested mountain slopes following either the west prong of the Little Pigeon River in Tennessee or the Oconaluftee River in North Carolina. Leaving the rivers behind the road continues up the mountain slopes pass grand overlooks of rolling mountains arriving at Newfound Gap which is more than 5,000 feet. There’s a parking lot at Newfound Gap with restrooms, hiking trails and a large stone observation deck perched above the gap. All of the mountain views from the gap are outstanding, weather permitting. My personal favorite view from here is the view of the Newfound Gap Road down below twisting and turning its way skyward. The Tennessee and North Carolina state line divides the backbone of the Smoky Mountains here at the Newfound Gap. The Appalachian Trail crosses here at the gap running along the highest ridges, crossing the entire length of the national park. For those wondering what a mountain gap is, it’s a low place along a mountain ridge caused by erosion the lower the gap often makes for easier crossing. Seeing these low spots or gaps along the mountain ridges often meant they have waterways that can be followed to the top where often there are headwaters of another waterway going down the opposite side. For centuries the Native Americans crossed near the Newfound Gap over the old Indian Gap two miles away, obviously a name given to the Smoky Mountain gap by white settlers who entered the region at the turn of the 1800’s. A lower, easier gap was discovered in the 1860’s, thus the name Newfound Gap took hold. Across the road from the parking lot going south from the Newfound Gap is the 7-mile Clingmans Dome Road. Clingmans Dome is the highest point in the Great Smoky Mountains National Park. 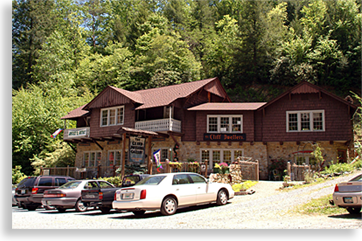 The trip across the park on Newfound Gap Road takes about an hour yet with so many opportunities for hiking, fishing, picnics, historic sites and general sightseeing, a one-hour trip can take from sun up to sun down. Clingmans Dome at 6,643 feet is the highest mountain peak in the Great Smoky Mountains National Park. It’s accessible by the Clingmans Dome Road located across from the Newfound Gap parking lot on Newfound Gap Road. Clingmans Dome Road follows along the ridge top for seven miles to the Clingmans Dome parking area and overlook. The views for this parking lot are bigger and bolder than at the Newfound Gap. At the end of the parking lot is a paved path 1/2 mile long to the observation tower at the top of Clingmans Dome. The path looks tame enough yet it’s considered a moderate to strenuous ascent up to the tower; millions use the path each year. 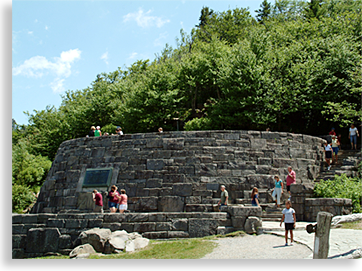 Seven states are visible from the tower on a clear day; the entire park can be seen from the 360-degree viewing tower. The Appalachian Trail passes beside the tower on its long journey across the Smoky Mountains. Holding back the waters of the French Broad River in the northern region of Sevier County and parts of Jefferson and Cocke Counties in the Tennessee River Valley is the Douglas Dam and Lake. The lake is over 40-miles in length with 555 miles of shorelines. 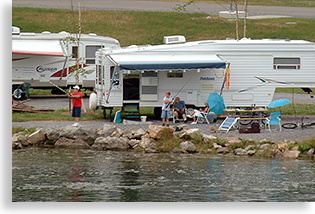 Boating, fishing, swimming, hiking and camping are what draw the excitement to Douglas Lake. The Tennessee Valley Authority constructed the dam in 1943 to help regulate the waterways of the Tennessee River Valley and the western watersheds from the southern Smoky and Blue Ridge Mountains. These valleys and mountains are a land of man-made and natural lakes. 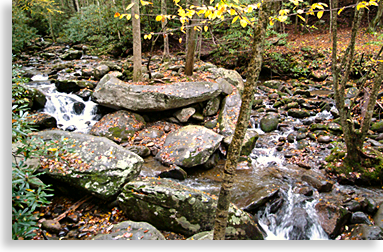 Just inside the Great Smoky Mountains National Park and next door to Gatlinburg Tennessee is the Roaring Fork Motor Nature Trail. This scenic drive takes you into the backwoods of Sevier County a journey back in time into an isolated region of the Smoky Mountains. 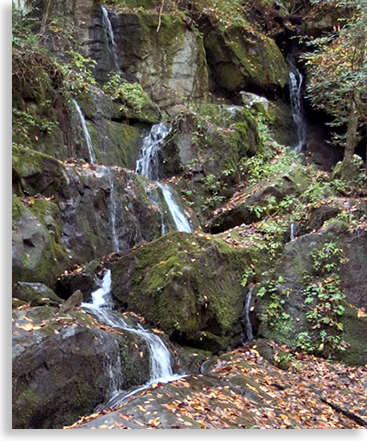 You can access Roaring Fork Motor Nature Trail in downtown Gatlinburg across from the aquarium. Signs will lead you out of town a short distance to Cherokee Orchard Road; just pass the orchard the scenic drive begins. With bustling Gatlinburg up the road the old mountain community seems out of place. The dense forest with its loud rushing creek was home to 25 families in the early days of settlement. Many of the old homesteads are still intact and well maintained, completely open to the public. This one way 5 1/2-mile drive along a paved road follows part of the original road constructed around 1850. Two popular waterfalls the Grotto Falls and Rainbow Falls are accessed here along the Roaring Fork Motor Nature Trail. The easiest accessed waterfall along the motor trail is Thousands Drips Falls near the end of the motor nature trail. The quite and natural beauty and wildlife still exist here the way it did over 200 years ago when the first settlers arrived, many of them looking for new opportunities, others receiving 40-acre lands grants as part of their service in the Revolutionary War. The contrast between Gatlinburg and the Roaring Fork Creek settlement are amazing, a must see example of then and now. Access to Roaring Fork Motor Nature Trail is for passenger vehicles only, RV’s and trailers are not allowed. Few roads lead into the Great Smoky Mountains National Park with only one paved road crossing the width of the entire park, the Newfound Gap Road. Greenbrier Cove is one of several remote coves (a small valley,) in the national park. Access to Greenbrier Road is near the town of Pittman next to the national park in Sevier County Tennessee. Following Greenbrier Road you travel along the middle prong of the Little Pigeon River. The cascading white waters of the Little Pigeon River has many outstanding views; once you pass the ranger station the road is unpaved. Many visitors to Greenbrier Cove come to see the falls called Ramsay Cascades, a 90-foot vertical plunge of water over several rock ledges. The Ramsay Cascades are the highest falls in the Great Smoky Mountain National Park at least the only falls accessible by trail. The other popular feature Greenbrier Cove offers is the Old Settlers Trail accessible from the Greenbrier Road. The road travels nearly 16-miles into the remote national park passing numerous homesteads that were abandoned when the Great Smoky Mountains National Park was created. Hiking, fishing, camping and sightseeing are favorite recreations at Greenbrier Cove. This popular cove in the Great Smoky Mountain National Park is located on the Tennessee side of the national park. Cades Cove is a lost oasis of mountain life and beauty encompassed by tall mountains in all direction. Cades Cove and its flat valley floor is the largest cove in the national park. There are so many attractions in Cades Cove it can be considered a half day of full day’s trip. The wildlife, scenery, trails, old pioneer homesteads and museum draw more than 2 million visitors each year campers are fortunate enough to spend days here not just hours. White settlers moved into Cades Cove in the year 1820 after the Cherokee Nation signed the Calhoun Treaty of 1819. By 1850 there were 132 households living in this isolated valley. Though Cades Cove seemed isolated and primitive today they were not. Many homes in this valley displayed a prosperous mountain society. They organized their local government, churches, schools, had mail and telephone service drove automobiles into and out of the cove enjoying every bit of their piece of paradise. After 1918 people stated leaving Cades Cove for better financial opportunities outside the mountains. 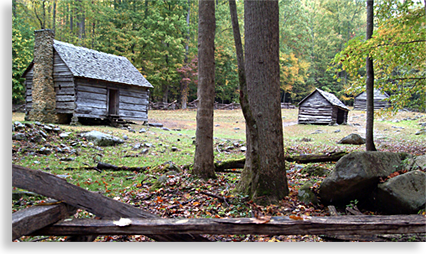 When the national park was established it bought up all the land in Cades Cove allowing some of the remaining residents to continue to live there, leasing the property until they moved out or died. Today Cades Cove looks so primitive and remote most visitors believe it always looked that way. After the last resident departed, the Park Service removed all traces of human activity except for the most historic structures, which they have kept open in an outdoor museum along the Cades Cove Loop Road. It’s the parks intention to return the cove back to the way the cove was before the white settlement arrive, leaving only traces of their earliest lives. The Cades Cove Loop Road follows a circle 11-miles around the outer edge of the cove, which to most look like a large mountain valley. Halfway around the loop is the Cable Mill at Cades Cove Visitor Center where you’ll find still in operation the old water-powered gristmill and other features. There are campgrounds and several hiking trails in Cades Cove with Abrams Falls at the top of the list. Abrams Falls on Abrams Creek is a cascading waterfall 25-feet tall whose waters fall into a pond often filled with trout. Within Cades Cove you’ll witness wildflowers and wildlife, a place of natural beauty between heaven and earth. You can reach Cades Cove from Gatlinburg by going to the Sugarland Visitor's Center in the Great Smoky Mountains National Park, turn right at the visitor's center onto Laurel Creek Road or take highway 73 from Townsend Tennessee for 2-miles to Laurel Creek Road. Laurel Creek Road will take you to Cades Cove Loop Road. CENTRAL FOOTHILLS PARKWAY: This 16-Mile section of the Parkway lies in wait being that 1.6 miles of ravines and rocky ridges have created an obstacle for its completion. This section of the Foothills Parkway travels from Walland in Blount County to Wear Valley in Sevier County. Engineering obstacles and environmental issues have put a hold on this section of the Parkway. Landslides have to be stabilized and ravines have to be crossed, up to 10 bridges will be required for this section. No motorized vehicles are allowed on this uncompleted section of the Parkway. Hikers along with mountain bikers and horseback riders are often seen along the road making the journey to experience the views. Sections of the road along the ridge can be seen from the valley below just a taste of what’s still to come. No date of completion has been set. Whether it be strenuous or moderate, infamous or obscure the Great Smoky Mountains National Park has over 800-miles of hiking trails. From the level stroll along a forested path between Gatlinburg and the Sugarland Welcome Center just inside the national park, to the legendary Appalachian Trail bridging the entire backbone of the Great Smoky Mountains, trails are in abundance in and around the national park. “These many trails,” will take you into a world of natural wonders within the parklands. Long and short trails will expose hikers to pure silence where only nature speaks. Climbs up mountain slopes lead to spectacular mountain vistas. Journeys into the forest will take you to strange rock formations, lost coves, deep dark gorges with roaring white waters, hidden waterfalls and the remains of historic settlements or archaeological sites. With wildlife, trees, shrubs and wildflowers the Great Smoky Mountains National Park is a natural garden world within a delicate watershed. Some hikers spend days on the trails others enjoy short walks. Some trails, just beyond the parking area you'll find cascading creeks, waterfalls and historical sites. 800-miles of trails verses over 300-miles of roadways in the park help to protect most of the natural wonders in the national park. Only one road US 411 crosses the national park most of the roadways journey into park a short distance and stop. A few of the more popular trails in the Great Smoky Mountains National Park are; short and long hikes along the Appalachian Trail, Abrams Creek in Cades Cove, the Chimney Tops Trail and Alum Cave Trail along the Newfound Gap Road, the Oconaluftee River Trail and the 2-mile Gatlinburg Trail that connects Gatlinburg to the Sugarland Visitor's Center. Outside and inside the Great Smoky Mountain National Park in Sevier County are miles upon miles of additional hiking trails, mountain biking, and horseback ridding trails with fly-fishing, whitewater rafting, camping and more. If you’re looking for an exciting vacation or holiday getaway, Sevier County has much to offer, check out each town for a more about that specific town and see their events and festivals. Sevier County is located within an hour’s drive from Knoxville Tennessee. Reaching Sevier County from Knoxville you can take US 411 and US 441 heading southward, these two highways cut through the heart of Sevier County.